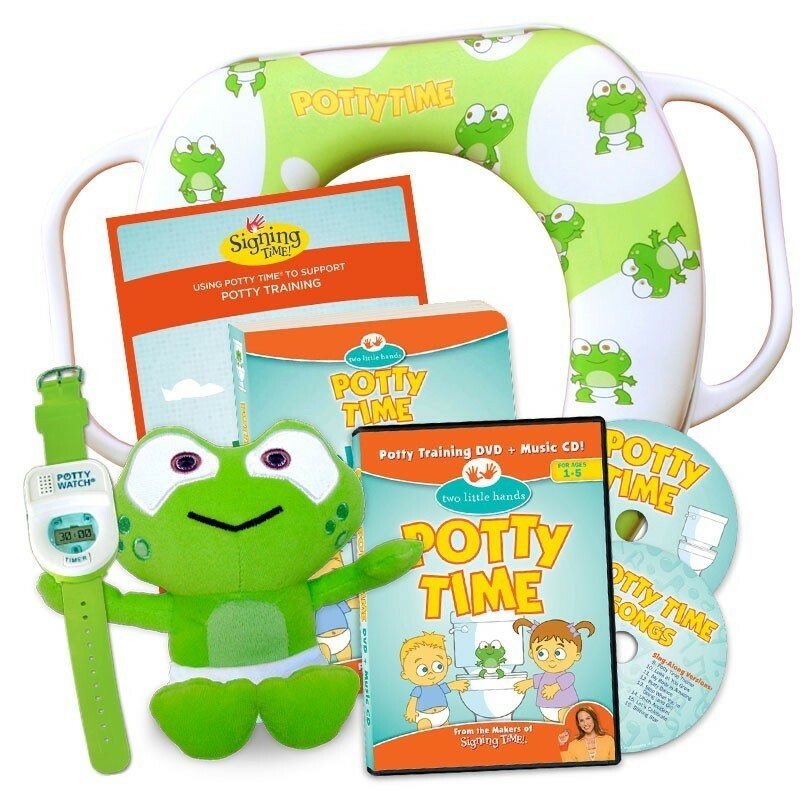 Get everything you need for potty training success: the Potty Time DVD with Emmy-nominated host Rachel Coleman, the Potty Time Music CD, potty training guide, Hopkins Uses the Potty board book, the Potty Time Watch, Potty Time Seat, and an adorable Baby Hopkins plush! Never forget a potty reminder again! The Potty Watch with timer makes it easy to be consistent. The colorful watch uses music and blinking lights to remind your child that it’s time to go! Encourage independence by setting reminders at 30, 60, or 90-minute intervals. (The patent-pending timer automatically resets itself again and again, so you don’t have to!) Use the Potty Watch to help your child stay on the potty longer by listening to songs in the "play" mode. Pediatrician recommended. Includes 2 AG-13 button cell batteries. For ages 18 mos. and up. Let this Potty Time star help motivate your child to potty train. This super-soft Baby Hopkins plush is wearing his big boy underwear/training pants. He’s just too big to wear a diaper! His removable underwear makes him the perfect teaching tool for potty training. Approximately 9 inches. Conforms to CPSIA safety standards for all ages. Hopkins the Frog will make it fun and easy for your child to “hop on up” to use the big toilet! This padded seat fits snugly on most standard and elongated toilet seats. Easy-grip handles provide extra safety and stability for your child. Handles increase cleanliness by giving your child something other than the toilet to hold on to! The removable cushion makes cleaning easy, and the built-in splash guard prevents messes. Recommended for children 18 months and older. Adult supervision required. In this guide, “Using Potty Time to Support Potty Training,” we’ll start at the very beginning by helping you identify when your child is ready for potty training and how to get started. We’ll provide practical potty training tips, talk about how to approach nighttime training, and discuss potty training children with special needs. Along the way, we’ll highlight helpful resources and websites.